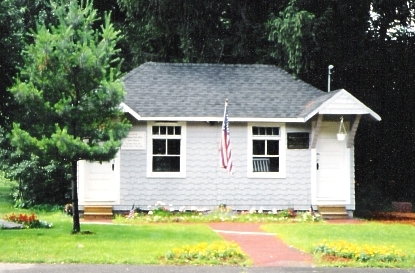 This was the first Framingham Post office and it was opened June 18, 1878. The Post Office doors closed in 1933. 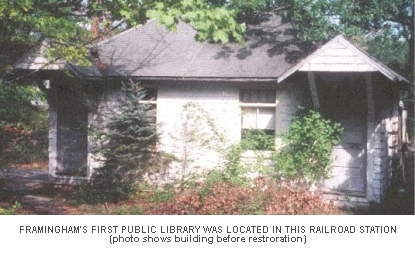 However in 1905 the Framingham Pubic Library took over half of this small building, which is only 12 X 24-feet. It was called the Nobscot Depository and it was closed in 1953. 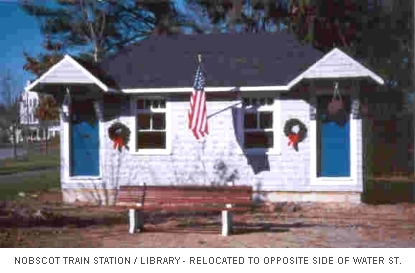 At the rear window you could also purchase your railroad tickets. This building was totally utilized and it has been saved. This little gem of a building was moved across the street and now faces Water St. The "Station" has been painted and most utilities are hooked up. Bricks were sold to fund refurbishing of the interior and the utilities. With it's new 30-foot brick walkway leading to the post office and the bricks inscribed with donor's messages that allowed people to "be remembered and be a part of (Framingham) history". Now that water is hooked up for watering the shrubs and flowers blend the little building nicely into the surrounding area.